Updated 6/07/17 - Currently no job openings at St. Catherine Preschool in Martinez, CA. 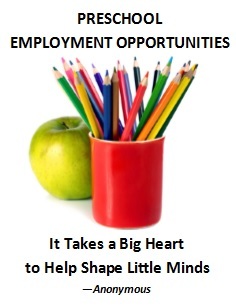 St. Catherine Preschool is looking for a teacher assistant P/T M/W/F from 8:30-3:00. 6 to 12 units ECE, and previous experience working with Preschool aged children preferred.